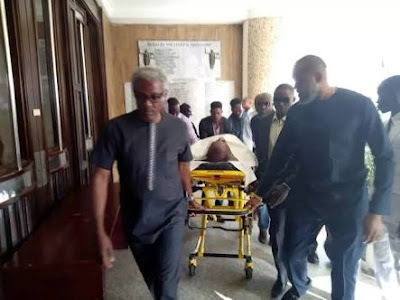 The embattled former National Publicity Secretary of the Peoples Democratic Party (PDP) Olisa Metuh, was today (Monday) produced on a stretcher before the Federal High Court in Abuja for his ongoing trial in respect of the N400m he allegedly received from the Office of the National Security Adviser in 2014. The judge had threatened to send him back to prison if he fails to show up. 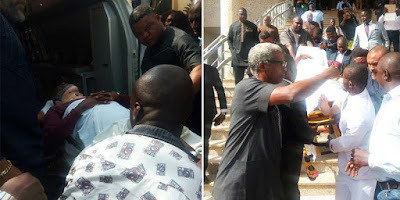 The trial judge, Justice Okon Abang, had to adjourn the matter due to the "condition" of the defendant. 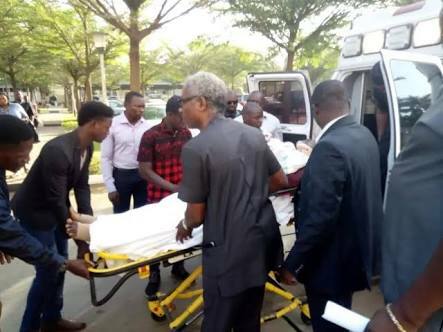 After the matter was adjourned, Metuh was taken to an ambulance of the National Hospital, Abuja, waiting outside the courtroom. He was driven off in the ambulance with number plate, 44Q 20FG, at about 10:27am on Monday. The case was adjourned till March 14.